A term coined in 1991 by journalist Joel Garreau, “edge city” is defined as a relatively dense concentration of business, retail, and entertainment outside the traditional downtown of major metropolitan areas. As suburban expansion during the postwar era took hold in the United States, edge cities emerged as important urban agglomerations in their own right, as illustrated in Dallas-Fort Worth by areas such as Las Colinas, Dallas Galleria, and Legacy Plano. They distinguish themselves by their largely commercial origin, emerging near major traffic intersections to provide abundant offices and shopping closer to suburban residents. Designed initially for the car, many edge cities in recent years have been redeveloped at the pedestrian scale by employing walkable districts and tying them to public transit. We approached two individuals who are deeply involved in the development of new urban centers to share their perspectives. One works within the traditional core of Dallas, and the other is making his unforgettable mark in the suburb of Plano. 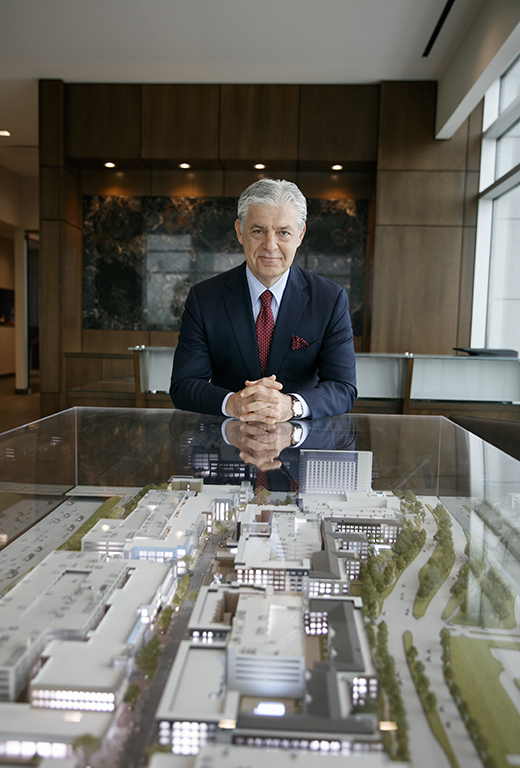 Fehmi Karahan is founder and CEO of The Karahan Cos. in Plano, which oversaw the development of Shops at Legacy, the metroplex’s first successful suburban mixed-use district. He is the current master developer of Legacy West, in which 240 acres surrounding the J.C. Penney headquarters have been converted into corporate campuses for Toyota of North America, FedEx Office, Liberty Mutual and J.P. Morgan Chase as well as a mixed-use urban village that includes retail, restaurants, hotels, apartments and condominiums. JM: Edge cities tend to arise in commercially thriving locations outside traditional city cores where large private developers are freer to influence planning on a large scale. Is this privately driven development preferable to one with more public intervention? FK: I think that without a doubt, having it privately controlled is the preferred method because when you’re public, you may have to go through certain bidding processes. I prefer to choose my favorite general contractor and subcontractors for my projects. When using public funds, we are subject to the open bids act, meaning that they may have to award a proposal from the lowest bidder. This lowest bidder may not necessarily be the most qualified, resulting in either the final product is not the quality you want or the project lingers for a very long period. People who work for the governmental agencies are working on their schedule. They don’t get paid extra because they work Saturday and Sunday, so trying to get the work done, an agreement done will have to wait until Monday. Imagine if they were reviewing our leases, our contracts; to someone at an agency, it doesn’t make a difference if our tenants go there or not, but for us it does. I’m going to stay up all night during the weekend, if necessary, making my list and reading a list of their wants. Profit and timing are very important in creating a new edge-city core, whereas city entities work on a fundamentally different platform. JM: As the individual who has been responsible in transforming one of the region’s premier edge cities into an urban core in its own right, what are your thoughts about the criticism that edge cities are inauthentic? Is Legacy in Plano true to the suburban character of its context, or is it intended as a kind of departure? FK: Absolutely! There was never any intention for these developments be true to Plano. I’m going to answer your question a little differently. When I walk to Legacy West or Shops at Legacy, watching the guests eating in the patios or shopping there, it reminds me of the cafes in Paris, of streets in Miami, of places in California. When visitors to my developments say, “This is not Dallas,” or “This is not Plano,” it’s music to my ears. We’re not building here in suburban Plano . . . a suburban product which would typically include surface parking, a Walmart, Target, Whole Foods or other big-box chain retailer. The kind of development we are building contains structured parking garages, a pedestrian-friendly, walkable environment that certainly is not a typical suburban development. Visitors love it because it offers them a completely different experience than the usual life in their home suburb. In general, there will be limited pockets of these kind of dense mixed-use developments at very strategic locations, offering an appealing downtown kind of environment. But as far as changing entire suburbia and all the streets and highways becoming more pedestrian, I don’t see that happening in suburban America for decades to come. Mike Hoque, turnaround entrepreneur whose well-known restaurants such as Dallas Fish Market and Wild Salsa have been credited with revitalizing Downtown Dallas and Main Street, founded Hoque Global Real Estate to spearhead major real estate projects within the Dallas central core and beyond. 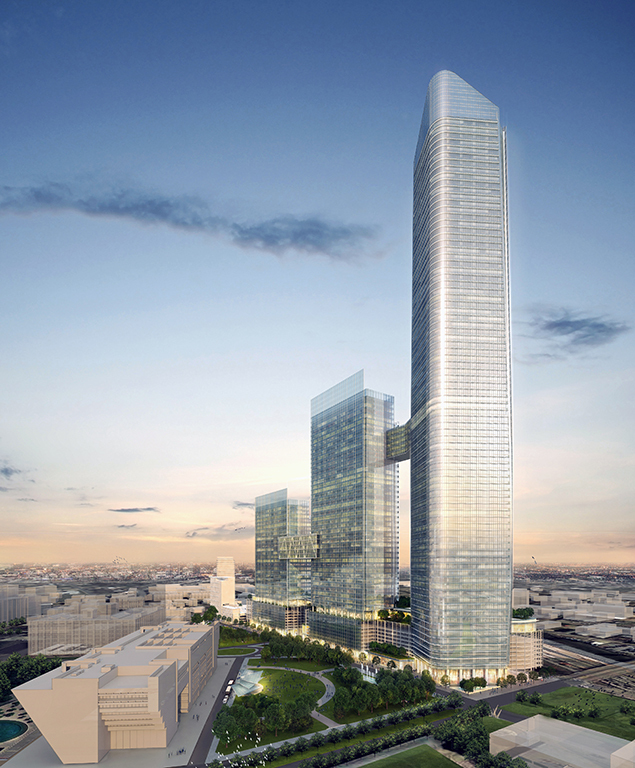 Hoque’s property—strategically acquired as the Dallas Smart District near City Hall—a proposed 20-acre mixed-use district designed by Hoque, KDC, and architect Pelli Clarke Pelli, could potentially be the headquarters for major global brands. 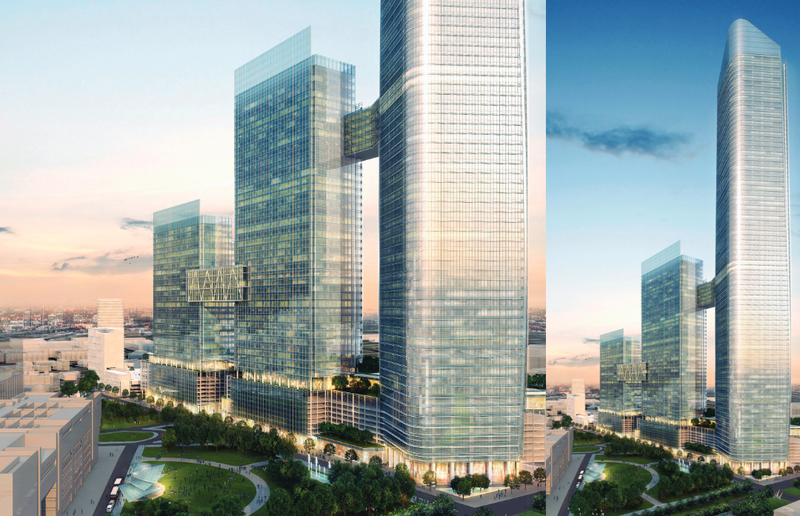 Understanding the key positioning of this area and its potential for re-development, Hoque Global strategically acquired the property for the Dallas Smart District. 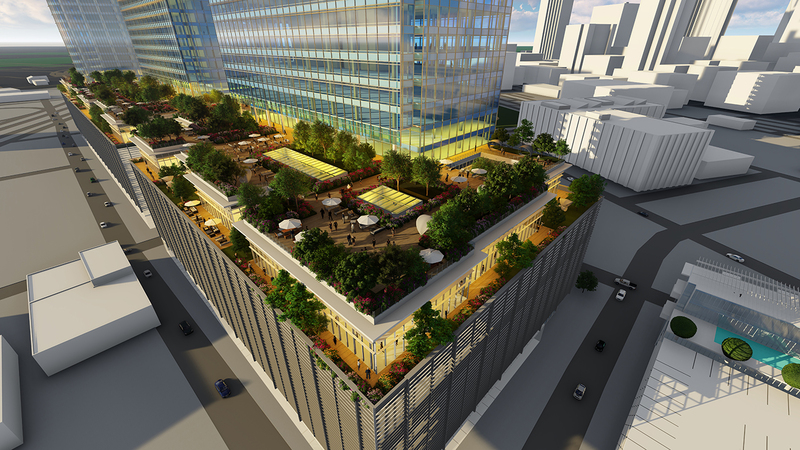 For the past three years, with diligent work and land purchases from dozens of owners, several blocks in Downtown Dallas were acquired with a goal of creating a vibrant development with lasting impact for the Dallas economy. JM: A defining aspect of any city is its inclusiveness: All are free to come and become a part of its commercial life as long as they submit to the maintenance of social order provided by city authorities. Are edge cities inclusive? Does their privately imposed order allow them be more inclusive? 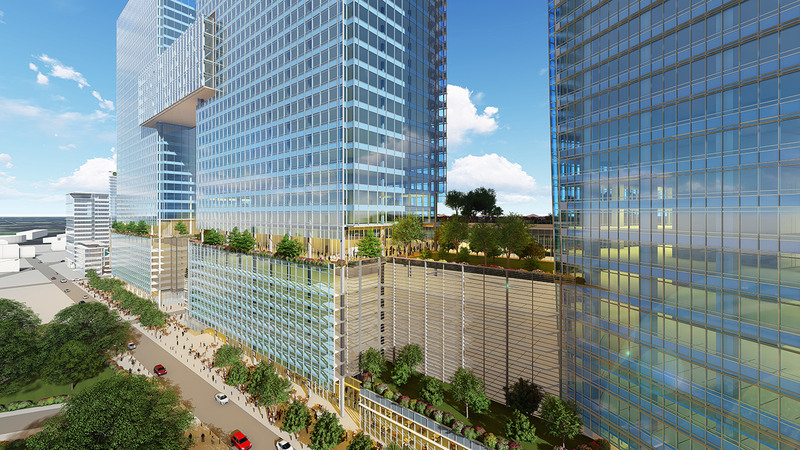 Hoque Global’s Dallas Smart District is an urban neighborhood with more than 20 acres in Downtown Dallas including international Class A office, residential, retail, hospitality and open space uses. 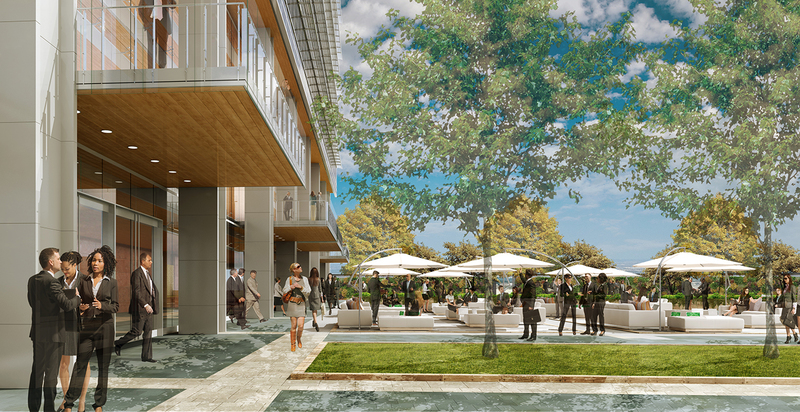 The master-planned development is located on several contiguous blocks that frame Canton Street from the Dallas Convention Center to the Farmers Market neighborhood, adjacent to Dallas City Hall. MH: I have been across the U.S. and the world, and I know that downtowns of large cities are irreplaceable. That is why I chose to do my businesses in downtown Dallas, back when it was a ghost town after 5 p.m. Downtown Dallas’ power and excitement as a burgeoning urban center had only to be nurtured and fostered to spark more growth. Today you will find 11,000 residents, and steadily counting, in the downtown core. Downtowns are special. They show the old and the new, not just the new. True downtowns are the melting pot of people from all backgrounds and ideas from all perspectives. Edge cities, many times characterized as too uniform and not as free-form, are succeeding by creating their own versions of the intriguing and complex nature and elements of downtowns. Now, as cities are revitalizing their downtowns, edge cities at various distances from downtowns are learning from their core neighbor cities by becoming more inclusive. There is an interesting exchange, especially in our city and region, between the core cities and the edge cities at varying radii, as brands create additional locations to share the energy and vibrancy of things everyone loves closer to downtown, making great experiences more accessible farther out. Edge cities are making things more interesting and more reflective of history and diversity — learning from downtowns — because that is compelling and makes life better for everyone and builds interest. 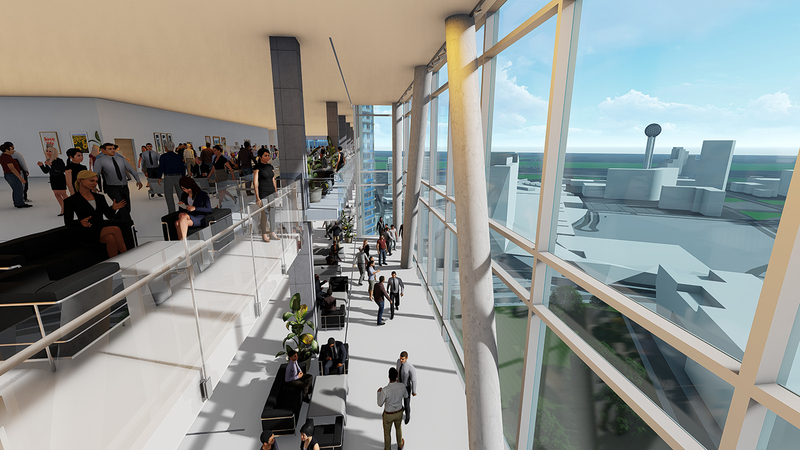 Hoque and Hoque Global joined forces with KDC and Pelli Clarke Pelli Architects to bring the development to life. The team began formulating plans in 2016. 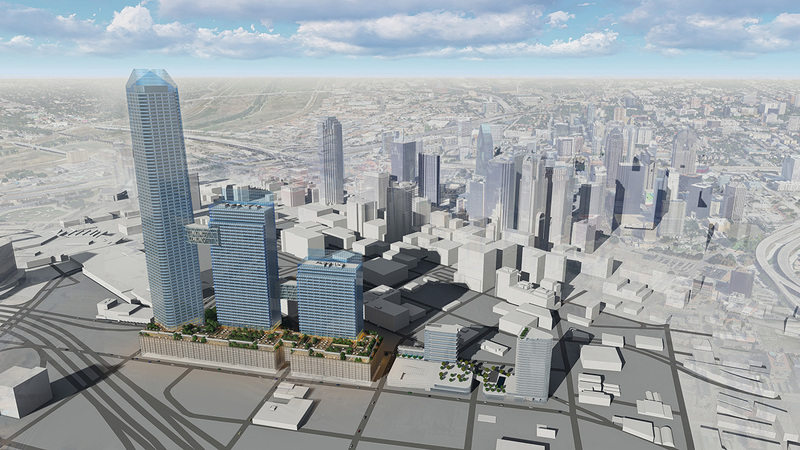 While Downtown Dallas Inc. has expanded its definition of downtown beyond the central business district, we will have our own new set of edge cities in proximity to downtown Dallas. After Klyde Warren Park was built, Uptown and now Deep Ellum have become very much connected to be among of downtown’s walkable neighbors. All of the Cedars is the next. This much-ignored southern part of downtown has unobstructed, stunning views of the skyline and lots of character and history, and Cedars as a gateway will soon experience phenomenal growth. Edge cities will be successful, and are being successful now, by being more open and dynamic — changing their approaches and changing perception. 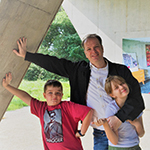 Julien Meyrat, AIA, is an architect with Gensler.